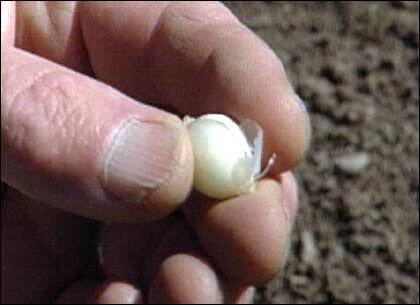 The outer wrapping of a bulb serves both as a nutrient-storing system and as protection from extreme weather conditions. Bulbs: It's hard to find another plant type that can yield so much beauty in the garden from so little work or worry on the part of the gardener. Provided you remember to plant your bulbs at the proper time of year, gorgeous blooms are a sure thing. What's extraordinary about bulbs is that they're essentially self-contained bundles of life. Their scaly outer wrapping is actually a highly efficient nutrient-storing system that makes bulbs well-suited to survive life underground, and able to endure extended periods of dormancy in extreme circumstances, bouncing back to life when conditions improve. Here we offer a few tips on plotting and planting bulbs in an outdoor garden, although it is also possible to grow bulbs in containers and, with a little extra effort, even indoors. With some bulbs, such as this ornamental onion, it's hard to tell which end is up. Next, fertilizer is important for bulbs you want to perennialize. Paul recommends mixing a little into the bottom of the hole. Special purpose-made bulb fertilizers are available from your local garden center, or you can use a super-phosphate. 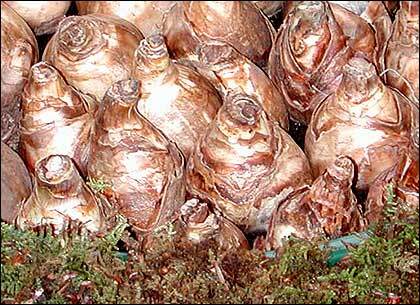 But the point is not to use anything too strong, mixing in the soil amendment well to avoid "frying" your bulbs. And then there's the question of which end is up. With many bulbs it's fairly obvious  you can see a few roots, which of course will go down, and the beginnings of a few shoots, which should be pointing up. But with some little bulbs, such as the ornamental onions, alliums, it can sometimes be hard to tell what's what. In those cases your best bet is just to plant the bulb sideways, which will give both the roots and the shoots a fair chance to find their respective ways in the world. Our tulip experts plotted out the bulbs before planting to ensure spacing and proportion. In the fall of 2002, Michael engaged the services of bulb experts Tim Gill, Gary Barnum and Tony Costanzo to help plant a section of the cutting garden with tulips that would bloom forth in profusion come spring. In general, more is more when it comes to planting tulips, which don't need a whole lot of space. The plan was to create a stand of flowers sufficiently dense that some could be harvested for cut arrangements without losing the wonderful overall effect of the massed tulips. 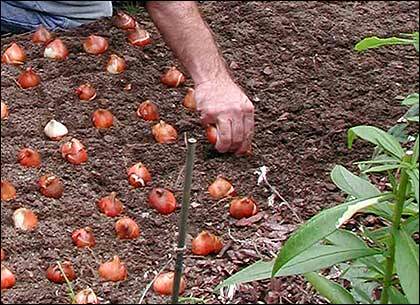 To accomplish this Tim, Gary and Tony recommend planning and plotting out your tulip bed with the actual bulbs just before planting them. For the Victory Garden, two tulip varieties Michael decided on were 'Catalina' and 'Queen of the Night', which they laid out closely spaced in a two-to-one ratio. "Over-planting" your bulbs is a good technique to use if you have limited space but still want a mixture of colors. In another area of the garden Tim, Gary and Tony used a different method called over-planting, which involves excavating your bed to the different planting depths required by each bulb variety. 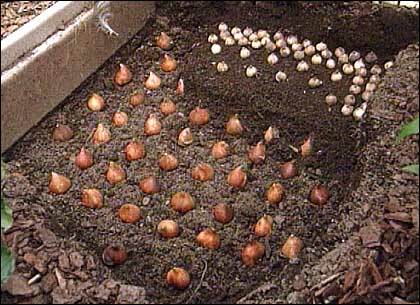 You then lay out the bulbs at the appropriate levels before refilling the entire bed back up to an even grade. 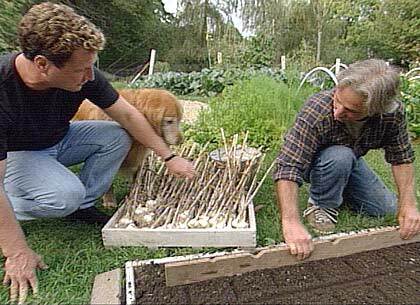 This is a great technique if want to do a very formal bulb planting, or if your garden isn't big enough to plant different varieties in completely different beds. This fall (2003), Michael and Kip infused the Victory Garden's perennial bed with a varied collection of bulbs, arranged to show off blooms while concealing messy foliage. Kip reiterated the advice of last fall's bulb experts that tulips should be massed to avoid a measly and sparse-looking display. In an area roughly 12 feet square, Kip laid down about 50 bulbs of the 'Little Beauty' tulip, a small variety perfect for the front of the perennial border. Because the foliage of this type of tulip fades quickly, the result is a nice array of flowers early on in the season. For the middle region of the perennial border, Kip and Michael selected the narcissus 'Stainless.' Unlike tulips, narcissus should not be crowded, but rather spaced about 6 inches apart, since they will multiply naturally each year when planted in rich soil. Kip threaded about 25 'Stainless' bulbs between the existing perennials in the center of the bed, which will help to conceal the unruly foliage of the narcissus. Michael and Kip plant cloves of last season's garlic for harvesting in the spring. Finally, for the back of the perennial bed, Kip spread out about 100 bulbs of the 'Purple Sensation' allium, which will sport huge purple globes in May and June. Because this variety of flowering onion grows to about 2 feet tall, the blooms will still be visible above the rest of the bed while the unattractive foliage is well concealed behind the other plants. By positioning the bulbs based not only on their height, but also their foliage and flowering timelines, the result will be a gorgeous bed full of blooms, with dying foliage hidden behind or among other plants. For additional information on working with bulbs, see "Bulbs 101" on the Web site of the National Gardening Association. This segment appears in show #2724 and #2826.